We’ll be looking at Options on Stocks, ETFs, and Indexes (the underlying securities) primarily because they are the most popular and the easiest to understand and put into your wealth building plan. Futures have options and can be traded as a replacement for the actual Futures contract, but their application is rather specialized and will only come into play in our discussion of the Futures market. The comparison above indicates how much each Strike Price is either “In the Money” or “Out of the Money” and has an influence on the Intrinsic and Extrinsic value of the related Option Prices, or Premium. An Option has to be “In the Money” to have Intrinsic value. Below is an example of the Option Chain for the Nasdaq 100 ETF (QQQ). 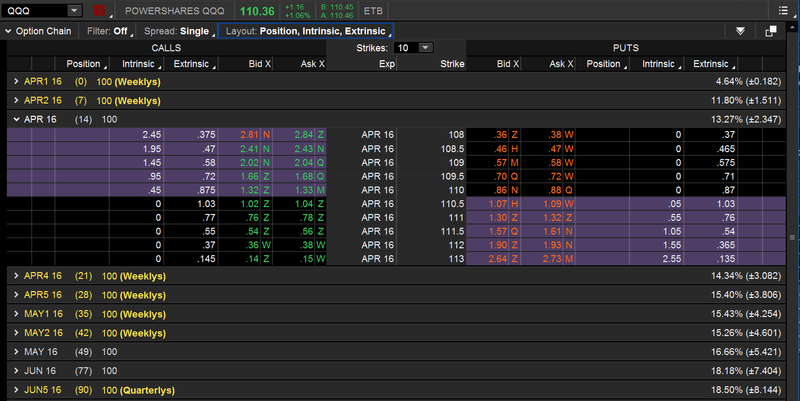 Notice where the Intrinsic and Extrinsic values stand in relation to the price of the QQQs and the various Strike Prices. Here, the difference between the Strike Price and the Option Premium, made up of the Bid and Ask prices, becomes clear. Taken April 1, 2016, for the April Monthly Expiration. In actual practice, though, the practical way to know what expiration cycles are available for any particular security is to look at its Option Chain. Generally, Monthly options expire on the third Friday of their expiration month, and Weekly options expire on the Friday of their expiration week. Quarterly options expire on the last trading day of the quarter ending in March, June, September and December. Technically, Monthly options expire on Saturday morning following the Friday of expiration; so, the Friday can be called “Expiration Friday” but really is “the last day of trading” in that cycle. Some securities have longer running Weekly’s, and certain Index monthly options can expire on the third Thursday of their expiration month, such as the S&P 500 Index (SPX), the Nasdaq 100 Index (NDX), and the Russell 2000 Index (RUT). 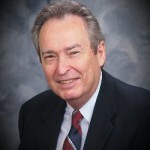 An American-style Option Contract can be exercised at any time during its expiration cycle. The owner of a CALL option can exercise their right to buy and the owner of a PUT option can exercise their right to sell the shares of the underlying security. All optionable Stocks, ETFs, and a limited number of Index options, like on the S&P 100 (OEX), have American-style options. Just so you know the difference, major broad-based indexes, such as the SPX, NDX, and RUT in the last paragraph, have European-style Option Contracts and can only be exercised upon expiration and expire on the third Thursday of the monthly cycle, as noted above. Make sure you know the difference, so you don’t find yourself in an unexpected situation. As a note of reference, which will come up in your later analysis, the two numbers opposite the option expiration cycle heading, all the way to the right, represent the Volatility of that particular expiration cycle and the Expected Change in the underlying security for the period of the option cycle. In the case above for the QQQs, the April monthly option expiration cycle has a Volatility of 13.27% and the QQQs are expected to move +/- 2.347 points from April 1, 2016, through April 15, 2016, which is the last day of trading for the cycle. These numbers change along with the change in the premium of the related options. The Bid/Ask Spread is also something to watch when trading Options. The “spread” is the difference between the Ask price and the Bid price. The Ask price of an option is the price you would pay to buy an option and the Bid price the one at which you would sell the option. Depending on volume, or the liquidity of the option, the Bid/Ask Spread can be very wide and cause the profitability of the option to be compromised. Covering a wide spread requires the price of the underlying security to move a greater distance to make the option go “In the Money” and show a profit. The higher the volume on the underlying security and the options that trade on the security, the tighter the spread will be, and, by extension, the probability of being profitable will increase. Judging the liquidity of an Option is very important to make sure there is a market available to trade. One of the best ways is to look at the Open Interest of the option, which represents the number of contracts that are active (not closed) for that option. A significant amount of Open Interest indicates a robust market of buyers and sellers. Volume indicates the level of current activity and can be used in conjunction with Open Interest to judge the viability of the market for any particular option. 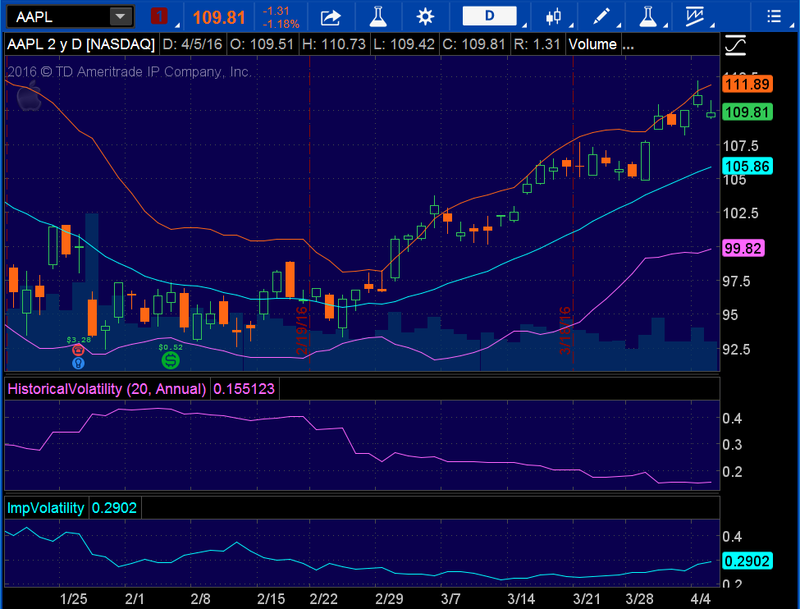 Here is an example of Apple (AAPL) options and their Open Interest and Volume. 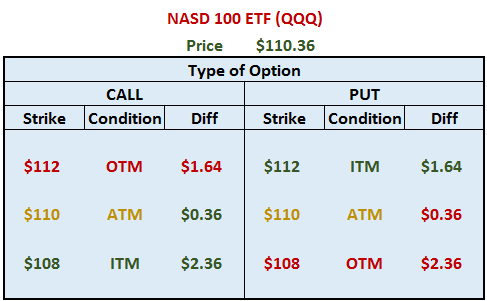 When you buy an option (Call or Put), you are Long that option. When you sell an option (Call or Put), you are Short that option. I make the distinction here to highlight the difference between being “Long” and “Short” the market. Being Long the market means you own a position that will benefit from a rise in the general market and, conversely, being Short the market means that you will benefit from a fall in the general market. As an example, you can be “Short the market” when you own a “Long Put”. With all the different metrics to learn about Options, the “Greeks” are the most confusing, yet they are very important to understanding how the option premium will react to market changes. As you get deeper into using Options, these indicators will come alive, so to speak, and will be critical in determining strategy and overall position management. Generally used at the trading system and execution level, it’s important to have a working knowledge of the “moving parts” of an Option in your overall arsenal of tools for the management of your wealth building effort. You might say this is part of your risk management awareness that will go a long way in improving your performance. Right now, you just have to know that the Greeks exist and how they might be used. Through education and seeing them used in practice, you will get an appreciation for how they impact your wealth building success. Delta – As the price of the underlying security moves, the Option premium changes at a disproportionate rate depending on where the Strike Price is in relation to the price of the underlying security. This relationship is measured by the Delta of the Option (in a range of -1 to +1) and is represented by how much the option will change for every $1 change in the underlying security. CALLS have a positive Delta, and PUTS have a negative Delta. A Call Strike Price with a .70 Delta will gain $ .70 for that $1 change. A Put Strike Price with a -.30 Delta will gain $ .30 for a related $1 change in the underlying security. The farther In the Money (ITM), the greater the Delta, and, conversely, the farther Out of the Money (OTM), the lesser the Delta. Gamma – Is the rate of change of Delta for a $1 change in the price of the underlying security. It’s significant because it shows how quickly Delta will increase or decrease. Gamma is highest when it’s At the Money (ATM) and decreases as it moves away, either farther In the Money (ITM) or farther Out of the Money (OTM). It is always positive. Theta – Measures the time decay of an Option for a one day move in the expiration cycle. 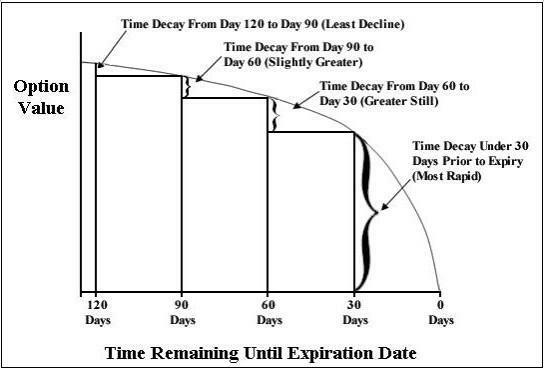 As the option marches toward expiration, the rate of time decay increases. Theta is one of the key metrics to be aware of when planning any Option’s position – it works in favor of the Option Seller and against the Options Buyer. Time decay is greatest At the Money (ATM) and decreases the farther it is away from that point in either direction. Theta is always a negative number. Vega – Is the rate of change in an Option’s premium with a one point change in Implied Volatility. It is a part of time value; so, the more intrinsic value the Option has the less impact Vega will have. Call and Put premiums increase as Implied Volatility increases and vice versa. Vega is greatest for At the Money (ATM) options and decreases as it moves away. Rho – Never used very much in the active trading of Options, since the effect on the premium is minimal, except for very long dated options. It indicates the change in the option’s premium for a 1% change in interest rates. An increase in interest rates will increase the option premium of a Call and decrease the premium of a Put. Price of the Underlying Security – This has the overriding influence on the amount of the option Premium – generally, a more expensive security will have higher priced options and vice versa. As the security gains and loses value, the option price changes. As touched on earlier, the degree that the option price changes is dependent on all the factors influencing the option and not only on the actual change in the price of the underlying security. Strike Price – The amount of intrinsic value an option has is determined by where the strike price is in relation to the price of the underlying security. The more intrinsic value the option has, that portion “In the Money”, the less influence the other metrics will have, and the option price will change more in line with the underlying security. This would be consistent with an increasing Delta reading. Time Decay – Every option has an expiration date and an extrinsic value representing the price the option buyer pays for the right to buy or sell a security during the life of the option. The closer the option gets to expiration, the less “time value” will exist. The option price erodes over the life of the option in degrees depending how far away the option is from expiration. The actual amount the option will lose on a daily basis due to time decay is represented by Theta. 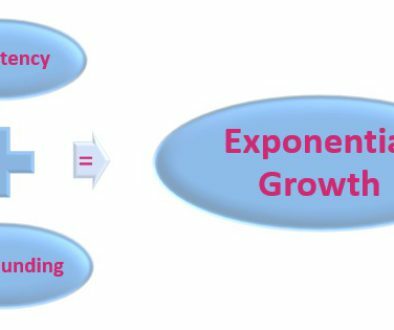 The chart below gives you a visual of this process and the accelerating time decay the closer the option gets to expiration. The more extrinsic value an option has, the more impact time decay will have on the overall price of the option. Weekly options by the nature of their shorter life, will experience less impact from time decay. Implied Volatility – Is an indicator of what the marketplace (controlled by the Market Maker) expects the future movement to be in the underlying security. The higher the expected fluctuations in the price of the underlying, the higher the Implied Volatility assigned to the option will be, which increases the extrinsic value of the option for both Calls and Puts. Implied Volatility is a metric to quantify the risk associated with the movements of the underlying security. The actual Volatility Index for the S&P 500 (VIX) is referred to as “the fear gauge” for the overall market. As the Implied Volatility increases and Option Premiums inflate, the amount the buyer of an option has to pay for the privilege of owning or selling the underlying security becomes more and more prohibitive. The general “rule of thumb” is to buy options with low Implied Volatility and sell options with high Implied Volatility. A note about Historical Volatility, which is the actual volatility (price changes) of the underlying security over a specific look-back period. Comparing where Implied Volatility stands in relation to Historical Volatility gives you the exact picture you need to judge whether the option premium for a particular security is under or overpriced. In Trade Options for a Better Life, the benefits of using options was clear, and one of the best attributes of options was the aspect of “limited risk”. This applies to buying options and option combinations (Debit and Credit Spreads) that provide a hedge against risk. However, selling an option without a hedge (naked) obligates the Seller to cover the position no matter what happens. In the case of a Call option, the risk is unlimited, because there’s no limit on how high a security can go. With a Put option, the risk is substantial but limited by the value of the underlying security, meaning that security can only go to zero and no more. Either way, you never want to get caught Naked. In fact, a very benign looking strategy people use with not even a second thought, the Covered Call, has the same risk profile as a Naked Put. Ouch! You’re capping your profit potential but keeping the risk in the underlying security – doesn’t make sense. You don’t have to — When you use Options correctly to control risk and enhance profits, you are in control – trading short-term positions for consistent, long-term growth. Then, the risk transfers to choosing the right underlying security and the right option strategy to make all the plans for growing your wealth work. The market and the securities you choose start to work for you and not against you. What this does is to change your focus from “worrying about the market or a particular security” to “maximizing performance and producing that consistent growth pattern”. The greatest risk you have is not understanding Options, the underlying securities, and the market in general. Approaching your wealth building plan with a base in education will ensure your long-term success. The Diversified Trader is here to help. Start getting that education you need by reading Education – The Path to Independent Wealth Management, and then develop your Wealth Building Plan, so you can Get Started taking control of your financial future. Take a look at the Risk/Reward graphs below for some common option strategies to get a feeling for how they work and how these strategies are structured. Again, education is the key to learning how these and other option strategies work. With the experience you gain from working with your Trading Partners, you will quickly learn the advantages of using options. The simplest of strategies: Buying Calls and Puts. The advantages of Leverage and Limited Risk make buying options the ideal replacement for buying or shorting any optionable security. Debit Spreads – A variation on the Long Call and Put and very powerful in its simplicity. This is a combination strategy where you buy an option and then sell one at a higher strike price (Call) or a lower strike price (Put). The two positions are also known as a Bull Call Spread and a Bear Put Spread. The objective is the same as just buying an option, the underlying security is expected to rise (Call) or fall (Put), but the advantage is that the cost of the position is reduced and the Short option provides a hedge against volatility. In cases where volatility is high, making the price of options higher than normal, selling an option against a long option (being hedged) protects against an abrupt drop in volatility that adversely affects the long option. The “Debit” refers to the cost to you to open the position, since the long option will be more expensive than the short option. The Risk/Reward calculation with a debit spread is positive, such as risking 1 point to make 4 points. Credit Spread – The reverse of the Debit Spread, these positions are known as Bear Call Spreads and Bull Put Spreads. This is another combination strategy where you sell an option and then buy one at a higher strike price (Call) or lower strike price (Put). They produce a “credit” to your account, since the short option will bring in a higher premium than the long option will cost. The Risk/Reward calculation here is also reversed and is considered to be negative, such as risking 4 points to make 1 point. 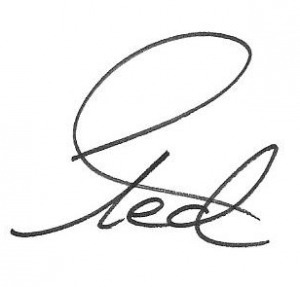 This strategy is generally used to generate income and needs to be managed carefully to succeed. It’s in common use and, with the right management, can work out very well. Knowing the market for the underlying security becomes the driving force in this situation. These examples are the tip of the iceberg. You’ll find that many other Option Strategies are available when you combine long and short option positions, different strike prices, and expiration cycles. The incredible power of options gives you any number of ways to manage any market condition to protect and enhance your portfolio and grow your wealth. The more sophisticated option strategies, though, are generally used in specific situations and to adjust the basic strategies above for adverse market conditions. These will come into focus as you build your education and experience in managing your wealth in those areas that apply to your diversified mix of trading styles. From what you’ll learn in Planning Basics, the Direction you choose and where you put the emphasis for each area of your wealth building plan will dictate how extensively you use all the variations available in the world of Options. Your next step is to begin learning how to manage your wealth with The Diversified Trader. Everything is easy – when you know what you’re doing.